At about the time this photo was taken, rhe school changed its name from Connaught Road to Hove Manor. Under the guidance of our Form & Art Master, Jack Mutton, the class I was in was given the task of designing the new school emblem. Jack Mutton was a great teacher for whom I had great respect. Anyone who showed an interest in art, talented or not, Jack offered support and encouragement too. One of my talented classmates involved in the project, was Ray Stevenson, who I later worked with at Jaycee Furniture. Ray became a Master Woodcarver and as such travelled the world demonstrating his talents as an ambassador for Jaycee. From left to right back row: Head Master Mr G. Ralph, Ron Hyde, name not known, Dennis - surname not known, Paul Blunt, art teacher Jack Mutton. From left to right centre row: John Cole, Mike Fogden, Chris Barker, name not known. From left to right front row: first name not known Davanport, name not known, Mick Lamb. I was not in this squad, but I made it the following year 1954. 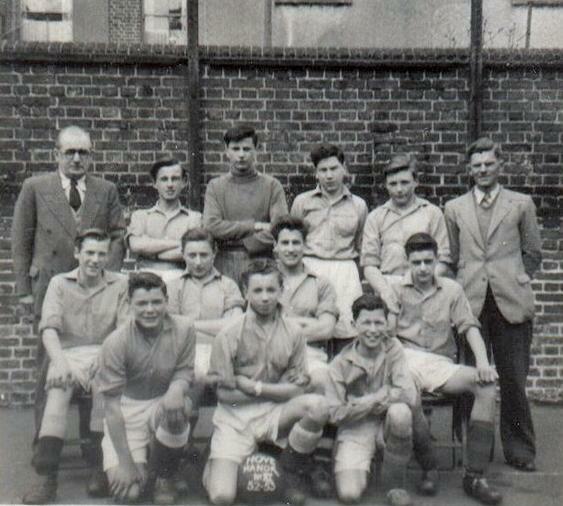 I will be posting a team photo of Shoreham Boys Club team with myself and Ron Hyde, I’ve forgotton the names of the others, I wonder if you are among them? At the ripe old age of 69, I’m still involved with football and am coaching at all levels. I obtained my Australian Senior Licence and Asian “C” Licence and I now have a Coach Instructors Licence which means that I conduct Courses for prospective “Junior Licence” Coaches, for which I get quite well paid. I didn’t play much after I left Shoreham Boys Club, except for a few Sunday morning games in Portslade Rec. I started playing again in Melbourne, Australia in the late 1970s and played my last Senior Game at the age of 53, the only game that I played with my three Sons! I made a comeback at the age of 63 when I retired to Queensland when I played one season of over 35s. I scored one goal for the season and decided enough was enough, my body was rejecting me! I attended Hove Manor from 1954 to 1958. My class teachers were Percy Frost, Jack Shorten, Bugs Bergenor, and Willi Ralph. The headmaster at that time was Mr Rothwell, and what a friendly man he was. He knew the first name of every student. Willi Ralph became headmaster when Mr Rothwell left to go to another school at Rye I believe, as this was after my time. The picture predates my period at the school, as Mr Ralph was much older when he took my class, but he was quite hip for the time, as he acquired a red Austin Metropolitan. I remember Frank Mutton, as I do his buddy Mr Langstone, they were both neighbours living on Hangleton Way. Other teachers included Mr Hurley, Mr Lewis (peanut) who lived in Lewes, and Mr Griffin I believe. Hi. I attended Hove Manor from 1950 -1954 and remember all those names. I am still in touch with Chris Barker. Percy Frost was the music teacher, and also the choir master at St. Andrews Church in Waterloo Street. Once had the ” slipper ” Off Mr. Griffin-ouch! I also went to George Street school from 1944 – 1950. To Richard White, Richard, It’s George Ralf that you can see in the picture. He was then Headmaster and the older brother of Willi. To Collin Shaw, I remember you Collin, we were in the same class and I remember the dust up you had with Percy. I have just found this page while researching the history of Brighton and Hove. Jack Mutton was my lovely dad. He was so happy teaching at Hove Manor school and very proud of the school’s good reputation. I would go in with him sometimes at weekends when he would prepare lessons. I remember polished wood and high windows. And I remember going on a school trip to the London Planetarium with them when I was about 10 – the only girl in a bus full of boys. All the staff mentioned are familiar names. I knew the headteacher as ‘Uncle Bill’ Ralph. Very happy times.